Koike Aronson Ransome provides customized designed abrasive waterjet cutting tables to fit standard or for special applications. The KOIKEJET® waterjet system is a heavy duty precision ground ball screw designed system for maximum precision and rigidity. 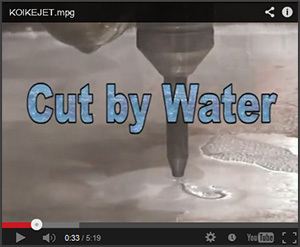 Using the water jet high-pressure cutting process to cut material thicknesses from gauge up to 8”, the KOIKEJET® waterjet is built to the most stringent standards in the machine tool industry.